Thanks to all (approx) 25 of us who got out last Friday. A dry and cool but not freezing night to travel through Edgelands and Ghost Streets north of the Don. A great mix of all sorts of us with some newbies who got straight stuck in. we’ll make it up Parkwood Springs another time! Weather forecast: very wet afternoon but dry by 18.00 so we’ll try it. Theme: Edgelands aren’t just the outer boundary, they are also the edges where changes in function and use happen. 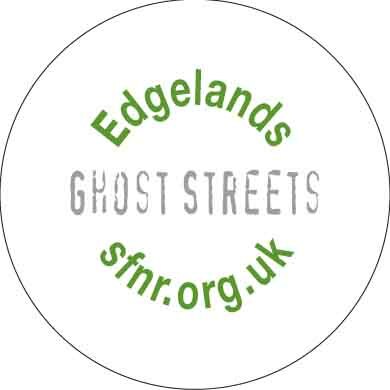 So a week Friday a FridayNightRide to see sheds, parking lots, pallets, panels, disused and unused streets, neglected buildings and structures, urban meadows and feral woodlands, landfill & semi-legal dwellings, places where dodgy things may happen, life on the edge? – with Sir Basil Spence’s St Paul’s Church on Parson Cross thrown in as a contrast, an architectural gem Grade 2 star listed so it is protected as a time capsule of modernism and yet has a tiny congregation who don’t necessarily want to be chained to this structure – is this on the edge? The book that inspired me is Edgelands by Paul Farley and Michael Symmons Roberts- also a Radio 4 book of the week. The authors came and read from the book and spoke at the Off the Shelf Festival in 2012 so I’ll bring my signed copy along! You can hear them on a radio programme Open Country, Edgelands from 2011. It’s well worth listening to and may inspire and encourage you to come on the ride and see the wonderful variety of landscapes in your city. Its really made me think and ponder – is SFNR a liminal activity? No more, come and ride and chat and take a ride on the wild side. Heads up: Roads, trails and lots of broken glass! so make sure you have tough tyres and bring a spare inner tube. About 13 miles.